Teplice nad Metují is the natural gateway to the Adršpach Teplice rocks if you’re using public transport. From all destinations listed below, it’s easier and quicker to get to Teplice than to Adršpach. There’s also more accommodation and better tourist information at this southern end of the park. 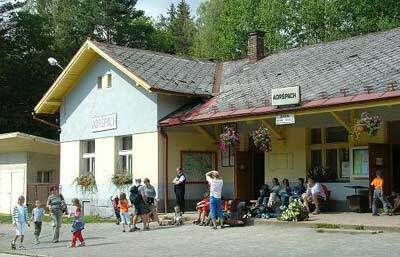 Trains travel regularly between Teplice and Adršpach and take 12minutes, stopping about halfway at Teplice nad Metuji-Skály (rocks) close to the park entrance, Pension Skaly and Hotel Orlik. It’s rarely possible to reach Teplice directly. You will have to change trains or buses usually in Hradec Králové, Náchod or Starkoč. Náchod is a pleasant small city with a renaissance chateau that peers over the town. It’s also a good place to cross the border into Poland with regular shuttle buses over to Kudowa Zdroj. The bus and train stations are adjacent in both Hradec Králove and Náchod. From Prague buses and trains make the 172km trip several times each day via either Náchod or Starkoč. The best connections take 3hrs20mins and the slower ones take up to 4hrs20mins. From Wroclaw in Poland the 169km trip involves changing at Kudowa Zdroj and Náchod and takes over 6 hours. From Olomouc the 195km journey can be done in 4hrs10mins four or five times each day, but you should get started before noon. Trains work out better than buses and you’ll need to change at Tyniště nad Orlici and Choceň or Česká Třebova. From Kutná Hora the best train connections cover the 153km in 3hrs 30mins, with changes at Poděbrady and Starkoč. From Telč, the 217km trip takes 6-7 hours and involves several changes. If it’s possible, it might be better to visit Olomouc or Kutná Hora in between. From Karlovy Vary & Český Krumlov it’s best to make your way to Prague and continue on from there as detailed above.